Cody Willoughby | Troy Daily News Piqua police officer Mallory Lash assists shoppers during the Christmas Outreach Program and Services (C.O.P.S.) event on Friday at Meijer in Troy. 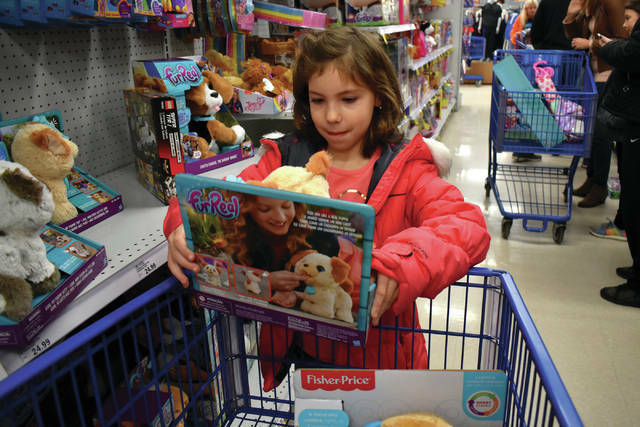 Cody Willoughby | Troy Daily News Hailey Bechtol, 7, of Troy chooses a gift for a child in need during the Christmas Outreach Program and Services (C.O.P.S.) event on Friday at Meijer in Troy. 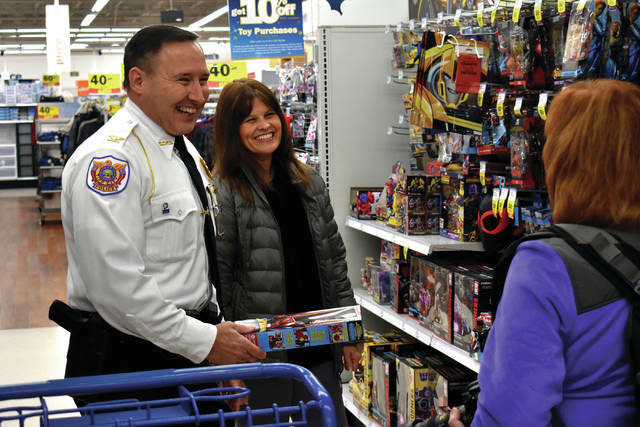 Cody Willoughby | Troy Daily News Tipp City Police Chief Eric L. Burris, with wife Tanya, assists local families in need during the Christmas Outreach Program and Services (C.O.P.S.) event on Friday at Meijer in Troy. TROY — Meijer served as the setting for an annual yuletide event on Friday known as the Christmas Outreach Program and Services (C.O.P.S. ), organized by the Miami County Fraternal Order of Police Lodge 58. 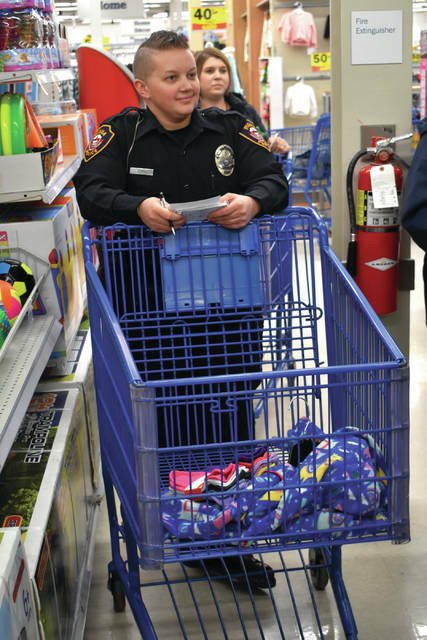 Each year, the event pairs Miami County families in need with a local law enforcement officer, who escorts them through the store to fill a cart with gifts and goods for the holidays. Presents for approximately 70 children from 40 families were gathered, with a budget of $100 per child. The event brings in participating officers from Troy, Piqua, Tipp City, and Covington police departments, as well as participants from the Sheriff’s Department, Miami County Victim Witness, and other offices. The long-running event has become an important tradition for Miami County officers. Along with an allotted gift-shopping budget, participating families are also gifted a Christmas dinner that feeds 6-8 people, which includes a ham or turkey, mashed potatoes and gravy, biscuits, green beans, and other sides. All Christmas dinners are provided by Meijer. “If they have a large family and more than eight people need to be fed, we try to provide multiple meals,” Ray confirmed. Each year, Lodge 58 raises funds not only for C.O.P.S., but also to benefit various non-profits and charities around the northern Miami Valley. In attendance at the event was 7-year-old Hailey Bechtol, who recently donated $106 to FOP Lodge 58 to be used in the event. “If they didn’t have this, some kids wouldn’t have Christmas,” Hailey said. Overall, the experience continues to prove rewarding not only for participating families in need, but also officers who volunteer, as each year more new volunteers show up to lend a hand. All presents purchased at the C.O.P.S. event will be prepared and wrapped at the FOP Lodge, and will be delivered to families by officers and Santa Claus on Wednesday, Dec. 12. The C.O.P.S. event is sponsored by Miami County Fraternal Order of Police Lodge 58, Meijer of Troy, and donations from private citizens. For more information, visit www.fop58.org. https://www.dailycall.com/wp-content/uploads/sites/30/2018/12/web1_COPS2-3.jpgCody Willoughby | Troy Daily News Piqua police officer Mallory Lash assists shoppers during the Christmas Outreach Program and Services (C.O.P.S.) event on Friday at Meijer in Troy. https://www.dailycall.com/wp-content/uploads/sites/30/2018/12/web1_COPS3-3.jpgCody Willoughby | Troy Daily News Hailey Bechtol, 7, of Troy chooses a gift for a child in need during the Christmas Outreach Program and Services (C.O.P.S.) event on Friday at Meijer in Troy. https://www.dailycall.com/wp-content/uploads/sites/30/2018/12/web1_COPS1-3.jpgCody Willoughby | Troy Daily News Tipp City Police Chief Eric L. Burris, with wife Tanya, assists local families in need during the Christmas Outreach Program and Services (C.O.P.S.) event on Friday at Meijer in Troy.